I have been spoiled this last year, with the kids off at university I wasn’t called on for breakfast duty. I could leisurely sip coffee with a few sections of the newspaper, glance at the today show now and then, and enjoy whatever I deemed acceptable for breakfast. Now, with them both home for the summer and dashing off to work early in the morning, I feel I should at least put in a bit of effort to make sure they are well nourished and prepared for the day. In large bowl add flours, salt, sweet and regular coconut sugar and mix well. In a smaller bowl or measure cup add coconut milk, eggs, and coconut oil, add to flour mixture. 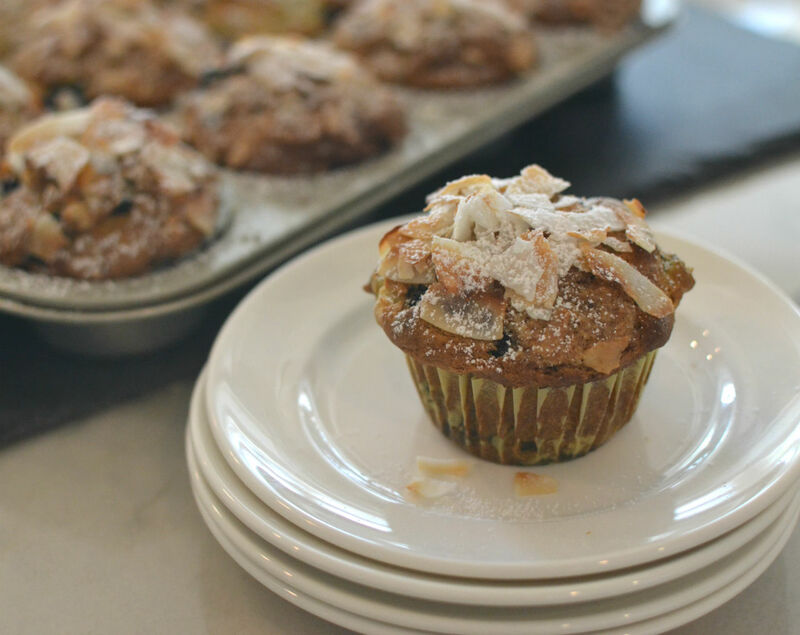 Drop by 1/4 into greased muffin tins, add streusel. Bake 22-25 mins, or until lightly browned and toothpick inserted into middle comes out clean. Remove from oven and let cool slightly, then remove from muffin pan and set on wire rack to cool completely before dusting with confectioners sugar.